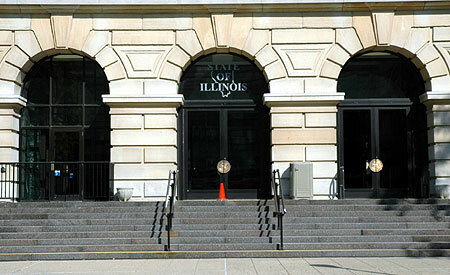 Illinois: State sovereignty, national union. 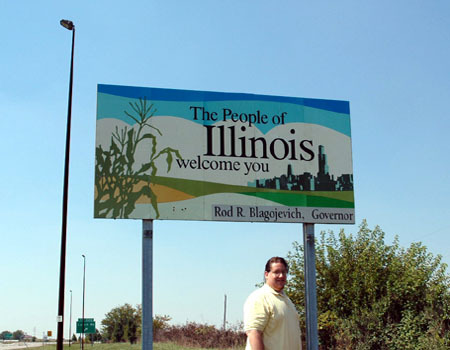 This was my entry into Illinois, making the Land of Lincoln the 38th state in which I have driven. I-74 was basically the most direct route from Indianapolis to Springfield. 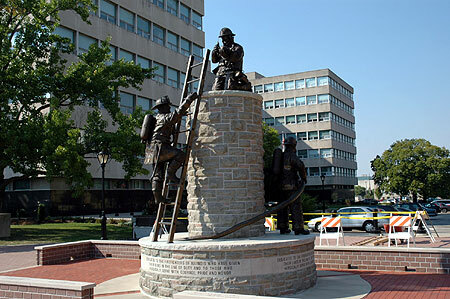 The only previous time that I had been to Illinois took me to the Chicago suburbs of Naperville and Lisle. I was a little surprised to find that Illinois also held one of the most desolate stretches of highway I've driven outside of Arizona or Nebraska: Interstate 72 between Decatur and Springfield. That the needle on my dashboard had a strong affection for the letter E wasn't helping matters much either. But I did make it into Springfield successfully, and once gassed up I could then fearlessly turn on the a/c once again. Central-southern Illinois is largely populated by cornfields. They weren't the tall, green stalks I remembered seeing in Nebraska, largely because of a mild drought this year. But don't let the agriculture fool you. 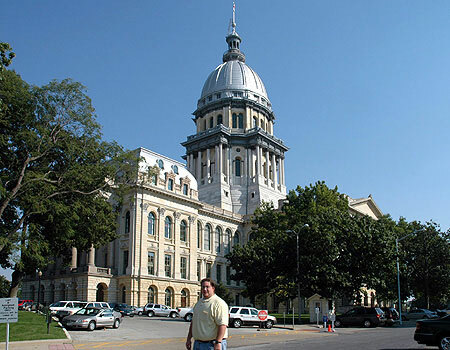 As John Stossel once pointed out, Madison County, Illinois, "home to more cows than people," is the class-action lawsuit capital of the United States. In case you're wondering, it's pronounced "Bla-GOYA-vich." There was a recent Lewis Black concert in which he was describing a trip to Italy: "I didn't know this, but Jesus Christ? Oh, He's big there! Everywhere you turn, there's Jesus, there's Jesus, there's Jesus! He's like the Coca-Cola of Italy." While maybe not Jesus Christ, Abraham Lincoln is certainly the Coca-Cola of Springfield. Unfortunately it was late in the afternoon by the time I-72 showed some sign of civilization, so there really wasn't enough time to visit the new Lincoln Presidential Library. I did get to visit his tomb in Oak Ridge Cemetery in the northern part of town. 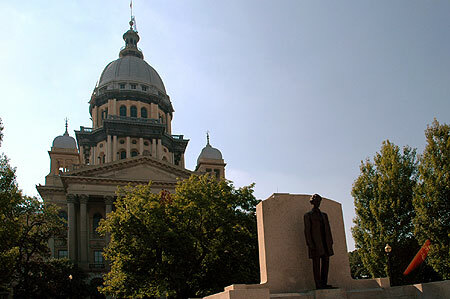 Like many states, Illinois has had several previous capitols and capitals. 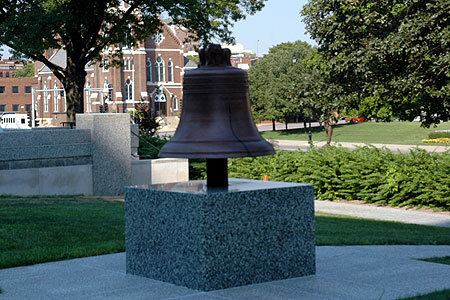 The first capital was a small two-story building in Kaskaskia, about 40 miles southeast of St. Louis. 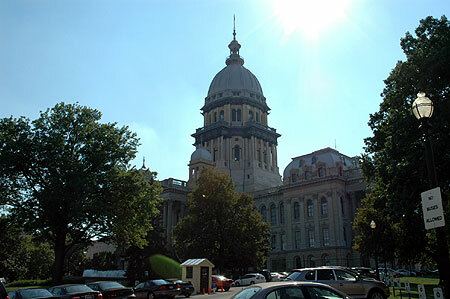 The capital was then moved to Vandalia. 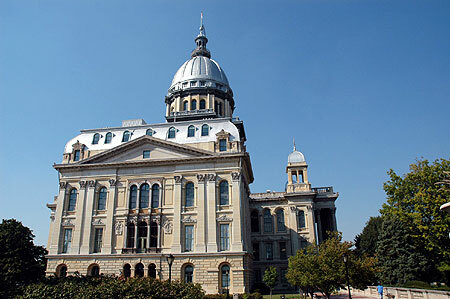 The first capitol there was similar to the one in Kaskaskia, which burned down after four years. 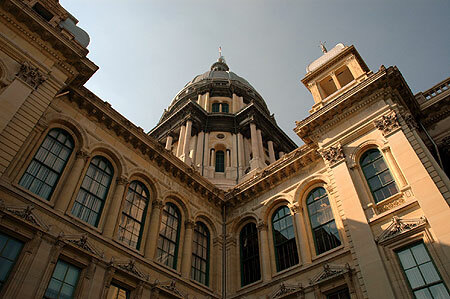 That structure was replaced twelve years later in 1836 by the Vandalia city fathers who, afraid that the capital would be relocated, thought that a new building would keep the seat of government in town. They were wrong. 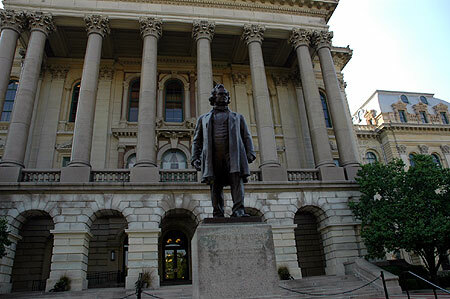 In 1839, voters selected Springfield as the state capital, chosen largely for its central location. 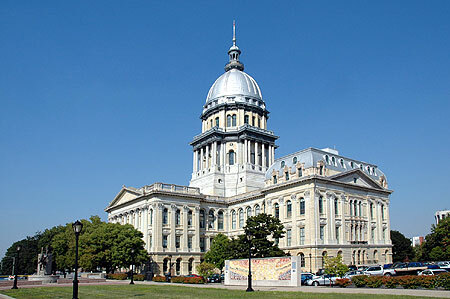 The current Statehouse was completed in 1888. Though I don't have a picture in Madison, by visiting Springfield I have now been to every state capital east of the Mississippi River. This page loaded in 2.157 milliseconds.